Great, great look!! I loved your sandals!! Congrats on your first interview sweetie! Love the look btw, very Olivia P., flawless! Have an awesome Wednesday 2! I love how well you matched all the browns! I enjoyed reading the interview as well :) That’s a cute story for how you have your blog name! Thank you for your comment, yes I also love maxi skirts. just posted a post about maxi/midi skirts. Lovely photos, love your shoes! Congrats for the interview,honey!Love the look! i LOVE fashion by HE! love those shoes, and your pants are always the perfect cut! Huge congrats to you! Will check it out! I like so much this look: it combines what I like to wear(Jeans!) in a very elegant way! 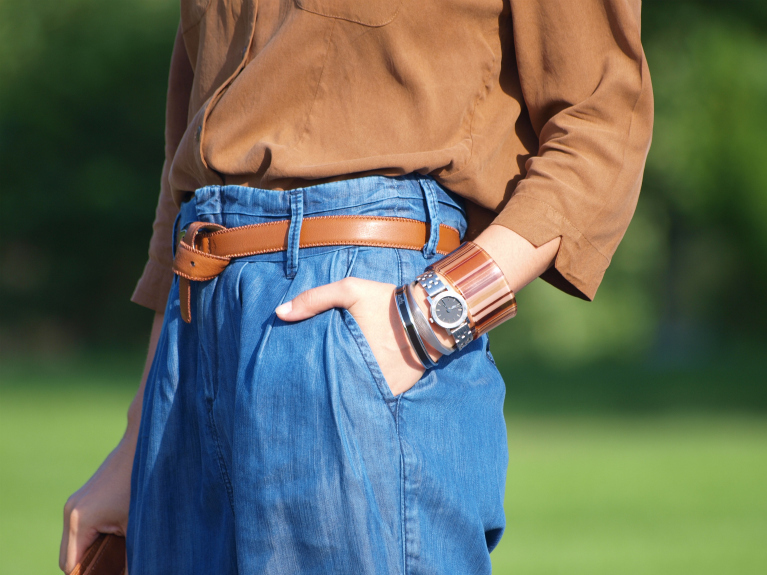 I love the combination of denim & tan, these 2 colors go so nice together! One more time your look is amazing! Indeed your blog is a great source of inspiration! Merci for your lovely comment! You know what chic is, so thank you very much for your kind comment. Please, do come back soo. Love how you mix the colors and always make a statement with a denim pop of color! I’m following your lovely blog! So glad to find it out! I’ll be very happy and excited to see you among my beautiful followers too! bag and sandals are my favorite items! great outfit! Buen dia!! precioso pantalon…siempre con looks hermosos!! besos y buen jueves!! Congrats on the interview hun!!! ;) U look great as always, I love this simple but so nice outfit! I will check out the interview now. Love your shirt. Congrats on the interview! I checked it out on the HE page! How fun!! I love these pants and shoes! Also your bag is super cute!! You look fabulous as ALWAYS! that camel color looks great on you! love this look!!!! I follow u! Looove the pants!Looking great with touch of brown.congrats on interview,you deserve it! I can not believe i wasn’t following you sweetie!!! I really thought i was!!!! Anyway i am now :) Beautiful pictures and a stunningly chic outfit!!!! 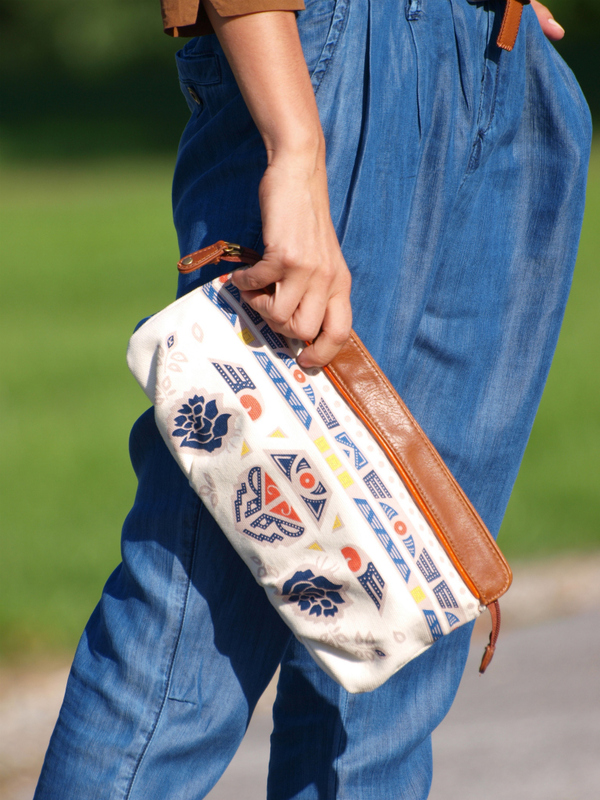 This outfit looks very nice, the blue an brown goes classically well, and I love the clutch! Congrats on the interview. Hello, I love yor look fantástic. The shirt color is beautiful and your jeans so cute. Kiss. i’m so in love with your shoes!!! I LOVE your clutch and shoes! omg one of my favorite outfits! I love every piece! especially the shoes! love it love it! @Julieta thank you very much for your kind words! thank you all for those wonderful comments! I appreciate it ! Hi! Veronica, waw you´re the most Elegant Blogger that I´ve ever seen… So I posted about your elegance in my Blog… I hope you check it. Lovely! You look great! Congratulations on your interview!! i love your outfit. a camel shirt is just what everyone needs nowadays. LOVE the slouch jeans paired with camel; gorgeous! Charlotte thank you for your comment!! Fashion for my is just a passion and another way to express myself …I am a artist and I love to create every day something new .. I wish you all the best and hope in one day to be a great magazine editor!